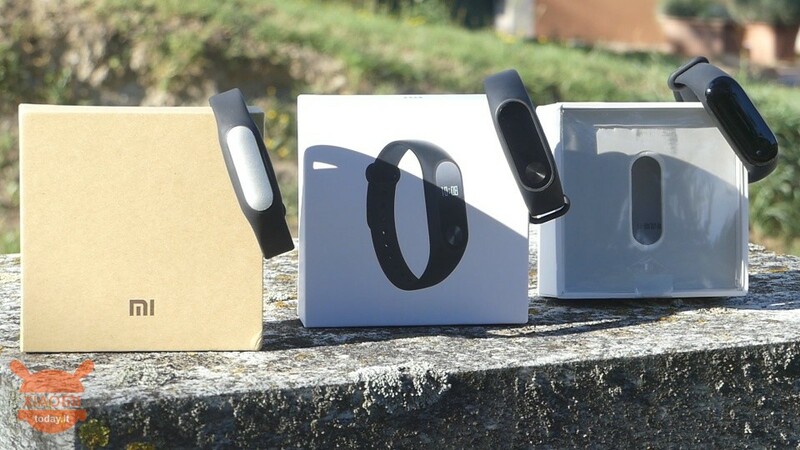 The first generation of the fitness tracker proposed by Xiaomi, the Mi Band, has literally shaken the technological panorama of the sector that at that time was beginning to assert itself. 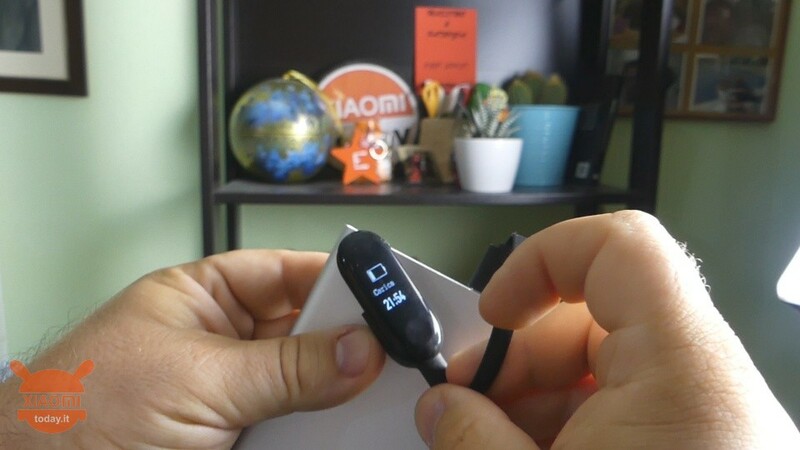 Since the first generation, Xiaomi has brought to the market a wearable gadget, simple, cheap but functional. 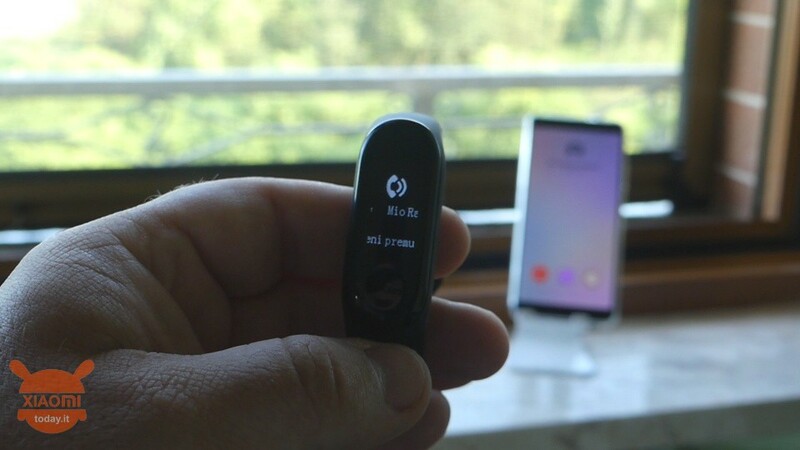 And this new Mi Band 3 does not upset the company philosophy, but renews and improves an already excellent product that does not require additional features, so do not waste any more time and start with our full review of Xiaomi Mi Band 3 thanking the store Gearbest.com for sending the sample. 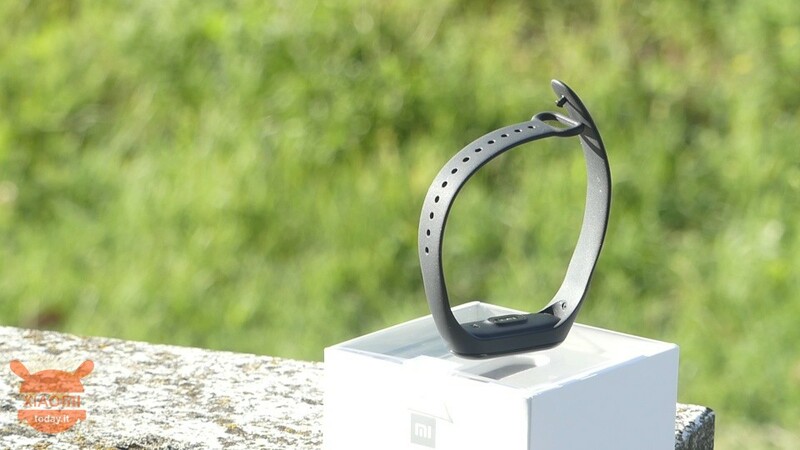 It's been almost two years since the previous generation, worn on millions of wrists, so it will be an arduous task that Mi Band 3 has as its goal, that is to decide as new queen of fitness trackers. And it does it by improving every single detail without giving up one solid base consisting of the excellent quality / price ratio. And we start right from the strap that is made with materials much more breathable. Even the coloring is more pleasant, tending more to a dark gray, than the heavy black of the previous generation, moreover the opaque effect seems to recall the tropicalized treatment typical of professional cameras. The cavity in which to insert the capsule is improved, avoiding accidental spills, as well as the closing system thanks to the adoption of a longer metal piston than the previous generation, making the strap never open inadvertently. Even the dirt seems to accumulate less, instead increasing the general resistance to twisting. 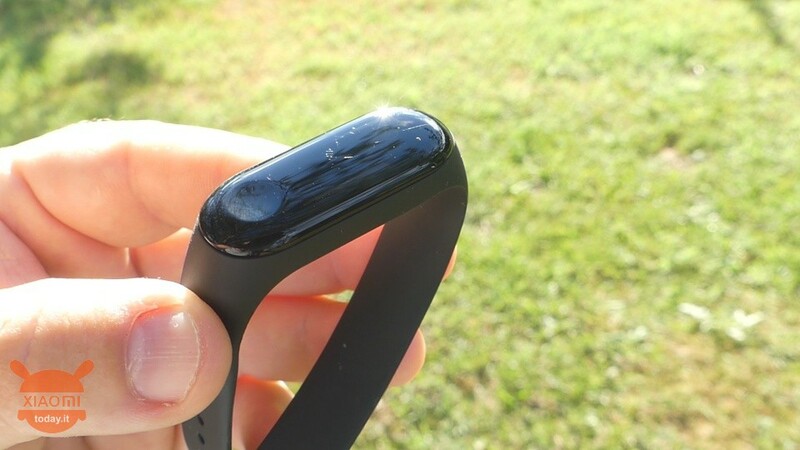 The renewal of the drop of the 3 Mi Band is what most strikes the eye, as the most marked lines are abandoned to accommodate one machining with 2.5D curvature on the edges greatly accentuated, making this new version similar to a small technological candy. The dimensions also increase (17,9 x 46,9 x 12 mm / 247 strap mm) even if the weight remains contained in only 20 grams with a footprint in contact with the skin slightly more marked as the capsule is housed slightly lower than the strap. And this allows, thanks also to one more pronounced protrusion of the PPG sensor, a net improvement in heart rate measurements adhering better to contact with the skin. 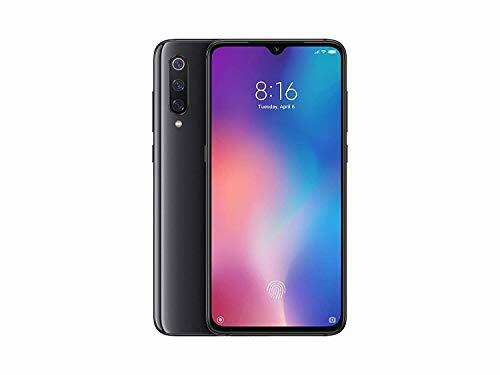 And I'll tell you right away, the increase in size does not allow you to take advantage of the old straps of the Mi Band 3 and even the accessory for charging, but fortunately the cost of these accessories is so small that it will be almost a pleasure to buy new ones. 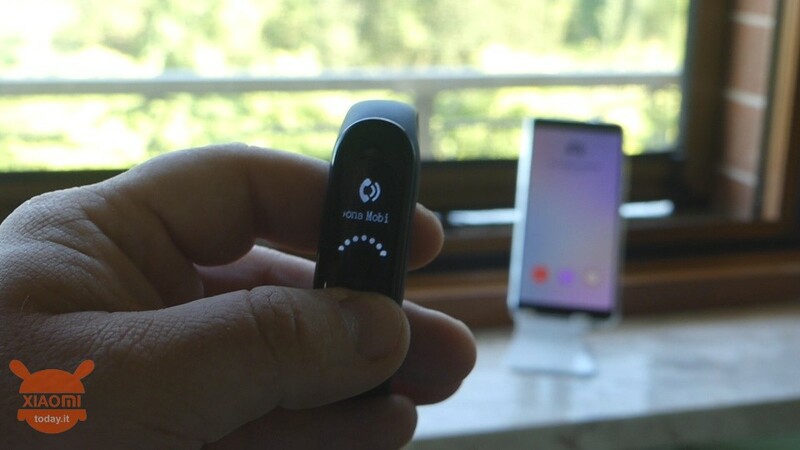 Xiaomi also on the new Mi Band 3 has further revolutionized design by doing literally disappear the soft-touch physical button, hiding it under the slightly concave glass in the point relative to the button. 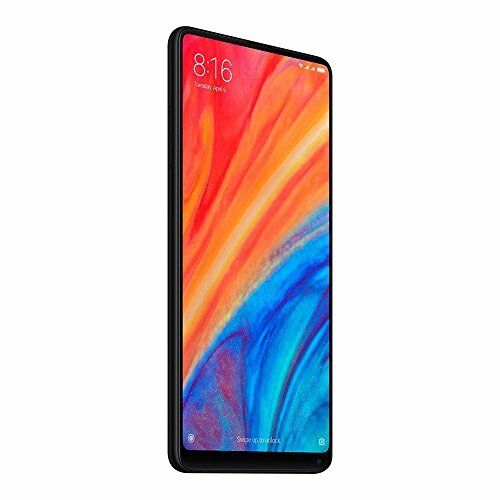 Unfortunately, however, the excessive crowning and protrusion with respect to the seat of the strap make the Display cover glass significantly prone to scratches due to impact. However, ergonomics are generally very good as it is a pleasure to wear the 3 Band, which does not create any annoyance, even when we write to the PC. 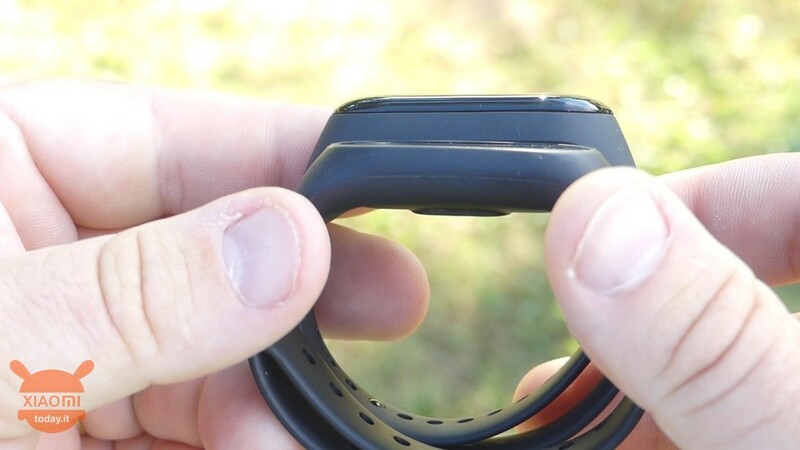 As mentioned before, the size of the 3 Mi Band capsule is slightly increased, and this is due to the presence of a wider display, an OLED from 0,78 inches with 128 resolution x 80 pixels that however it becomes touch using the gesture to move within the software menus. 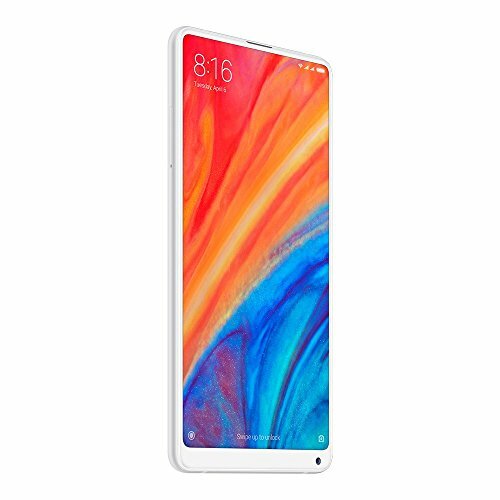 The display is activated either by touch on the soft-touch button or by rotating the wrist, which can be activated using the supplied appli- cation. 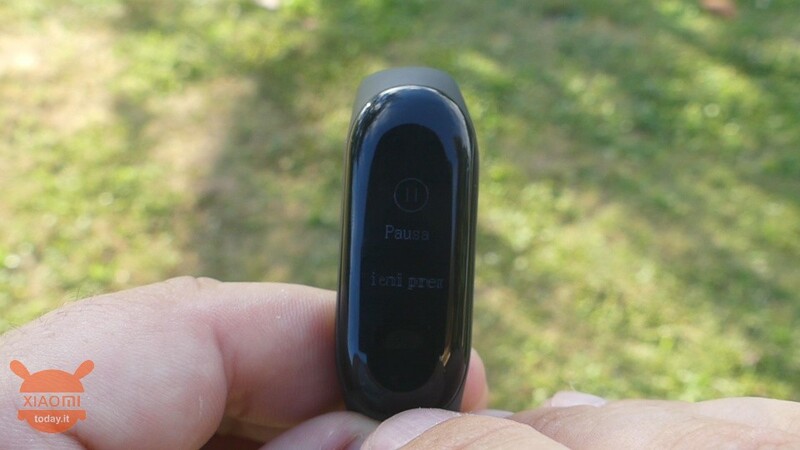 We could therefore move within the Xiaomi Mi band 3 menus with some lateral or vertical swipes while in some circumstances it will be necessary long press the soft-touch button to confirm some choices or with a simple touch you will go back. However, immediately remove the sore tooth, or the readability under direct sunlight, which is not improved by anything compared to the previous generation, indeed it seems almost worse. A defect to which one should turn a blind eye by virtue of the ultra-cheap price of the product, but still annoying. We are running during a workout and we want to see the instantaneous data of the same, but unfortunately we have to stop and then break the rhythm: this is the scenario we are going to meet with Mi Band 3. The widest display however allows view more information at the same time, using more characters, exactly 9 on 6 lines, which actually means at least partially read the text of the notifications. But let's continue the cognitive path of Mi Band 3 which is also improved in hardware. In fact, inside the capsule we find a accelerometer to 3 axis, un new Bluetooth module that goes to the 4.2 Low Energy (LE) version, the very powerful vibration motor and one infeed increased battery reaching 110 mAh. 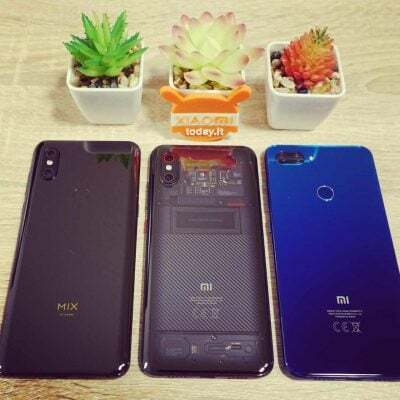 Finally, on the lower profile under the soft-touch button are the two electric pins, through which connect the adapter for charging, recommended as for previous generations, through power bank or through the USB port of the PC. 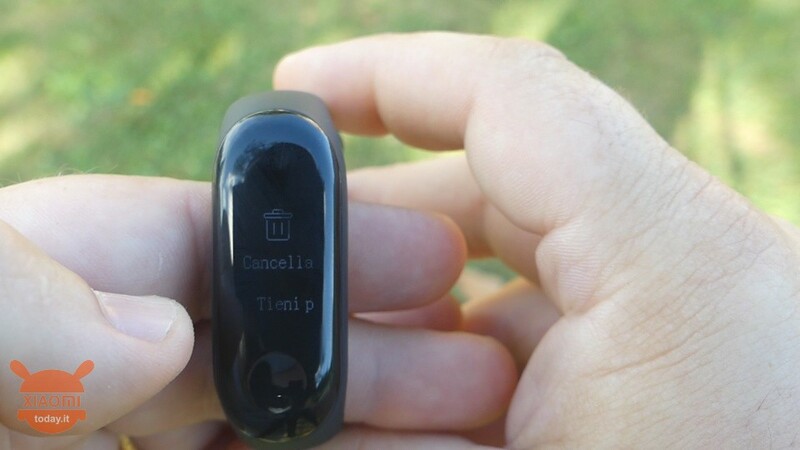 The electric pins are also indented with respect to the plastic shell of the capsule, perhaps due to the fact that the new Mi Band 3 it also improves on the waterproof side, arriving to offer certification up to 5 ATM depth (50 meters), which will allow you to take advantage of the technological bracelet also in the pool or in the shower without any problem, and believe me if I tell you that in a day spent in the pool practically immersed as a small hippopotamus in the water for 2 consecutive hours, the 3 Mi Band has not been affected. Too bad the monitoring of swimming has not been implemented, at least for now. 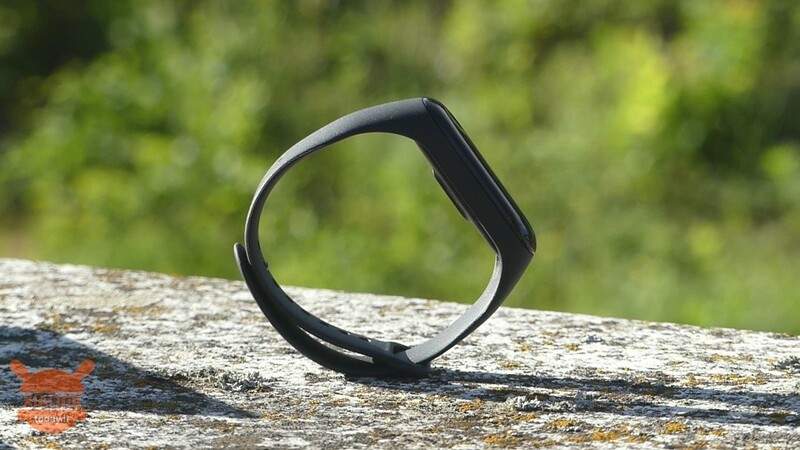 And before talking about functionality, I want to unveil theautonomy of the 3 Mi Band which confirms excellent, performing from 20 to 25 days depending on how you use it, but anyway in about 1,5 hours you will have full energy. 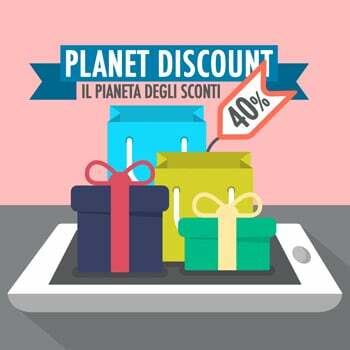 I personally in 9 days I have totaled about an 70% of download, considering that I have carried out the translation from Chinese into Italian, received many, too many notifications (at least 200 a day) and 2 sessions of sports about 1 now and always active heartbeat detection. Do not be misled by my results, also because honestly I have not made any special precautions personalized to my actual use, so the projection of the 20 / 25 days is more than confirmed. 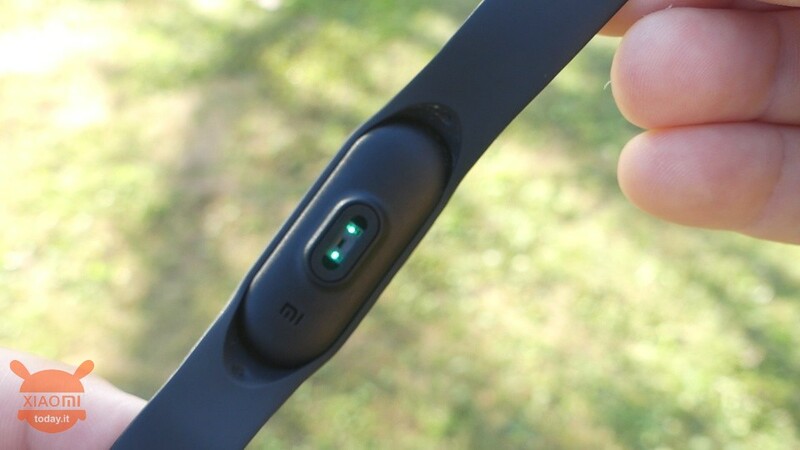 Well the first news I have in part in advance, because Mi Band 3 allows the viewing of notifications through text and not just through the application icon. We can Call up the latest 5 notifications received on your smartphone, from the dedicated menu section, though we can not interact in any way with them, if not by deleting them from the display, even if these then remain usable by smartphone and vice versa. 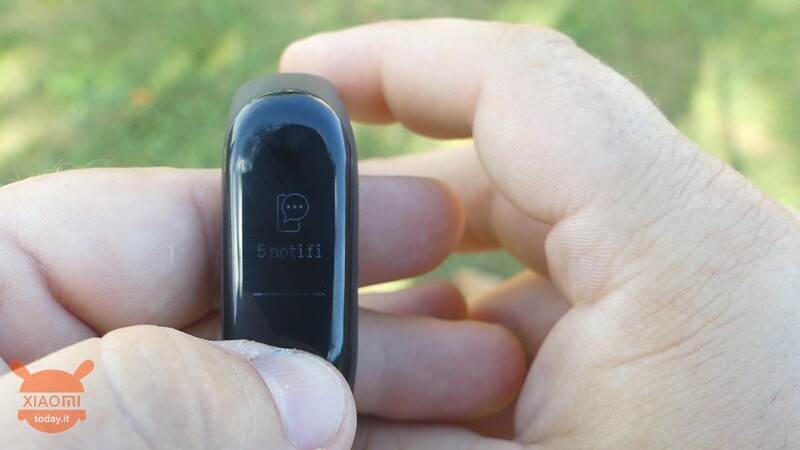 Upon receipt of a new notification the 3 Mi Band display will light up, allowing you to display the text for about 10 seconds, with specific details based on the notifying application. It is possible to read a message WhatsApp, Telegram or Messenger, or the title of a news notified by the Xiaomitoday.it app etc .. 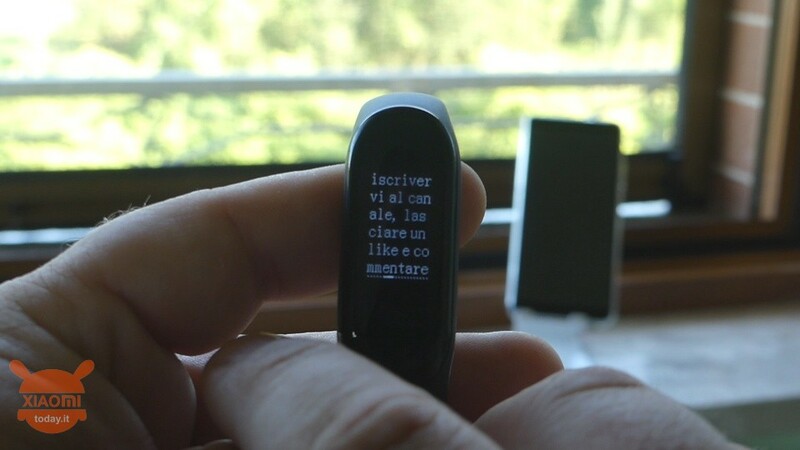 The notifications are not grouped by applications, but on the other hand, the Mi Band 3 is not a smartwatch, so as we say in Rome, everything makes broth. It should be noted that in some cases the reception of notifications is uncertain, sometimes they all come together. 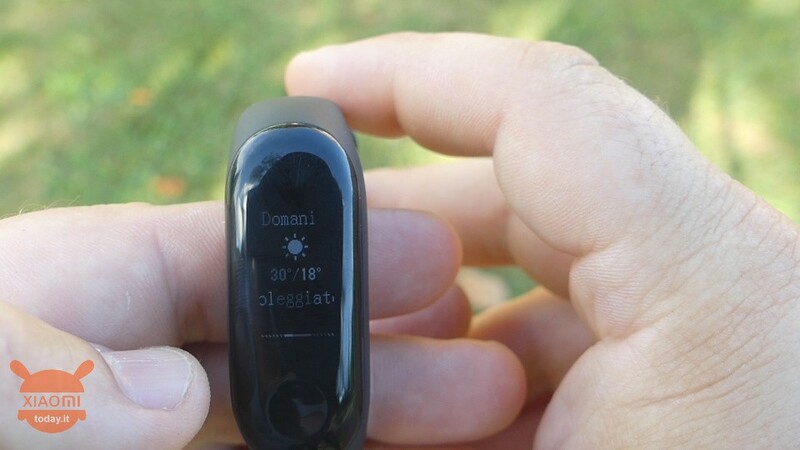 Finally the software of the Mi Band 3 provides the possibility of view the weather for 3 consecutive days, access a stopwatch, change the layout of the Home choosing between 3 different skins, including one that already integrates data related to steps taken and finally to play your smartphone, useful if you do not have it and you can not find it. Naturally, there is no lack of possibility consult data on steps and distance traveled, calories burned, measure cardiac frequeza and display the percentage of remaining charge. 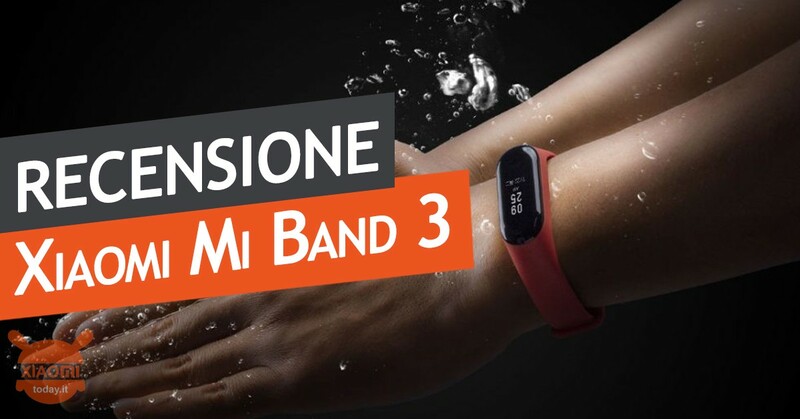 Fortunately, the Italian community has already managed to translate the firmware of the 3 Mi Band confirming in fact this version a new best buy albeit at the software level, through the Mi Fit application, no big news has been implemented if not precisely the continuous monitoring of heart rate. 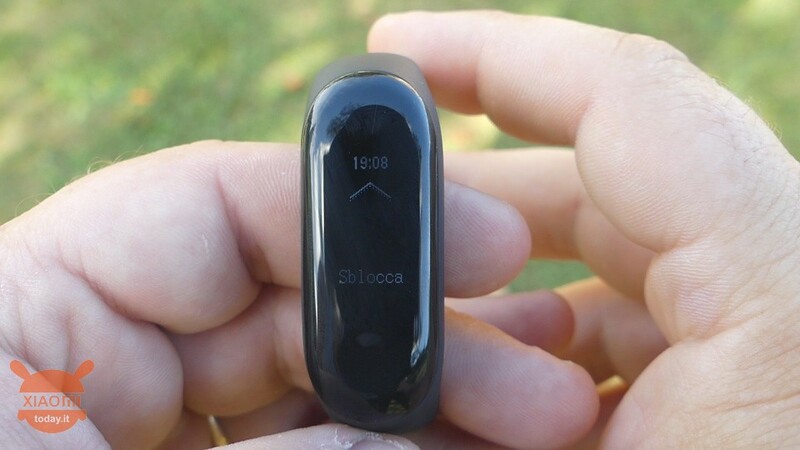 But in reality there are also other novelties such as the possibility of the screen lock, so you can access the functions of the fitness tracker by swiping from bottom to top. And this allows for example when you are in the shower prevent unwanted features from being activated by the time you are in it. Furthermore the possibility was introduced upon receiving a call, of which the name or number of the caller will be notified, of change the phone ringtone or hook directly. 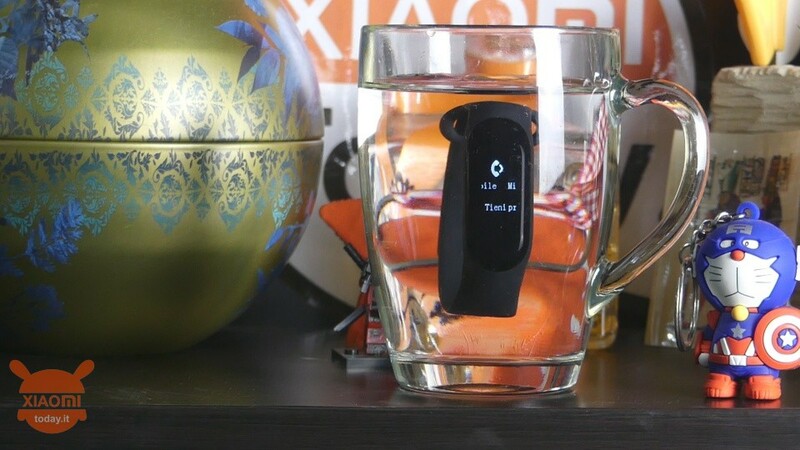 Finally when you start a business from the Mi Fit app, you can view the data related to the same directly on the display of the Mi Band 3, through which you can also pause or end the activity. For the rest, however, the functions remain unchanged, including the sleep monitoring which was almost always accurate at the minute, signaling the times of deep or light sleep. 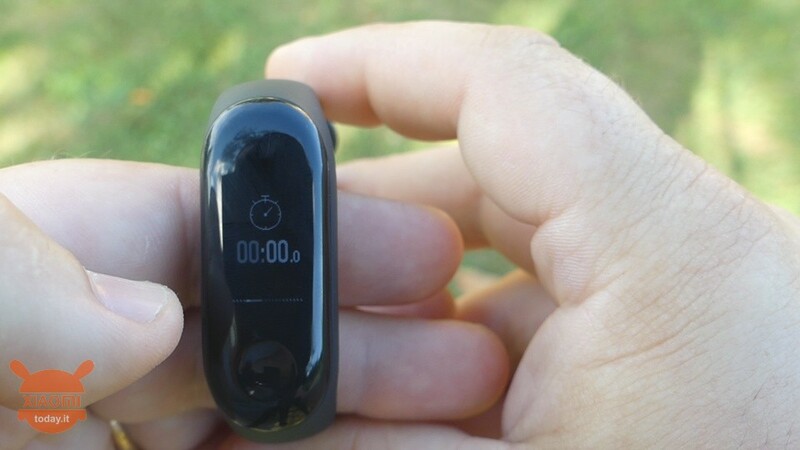 Needless to say, the Mi Band 3 is an economic product, complete with almost everything that a user can look for in a gadget for monitoring sports activities, but still basic. Surely it is not a product that caters to professionals, perhaps more to Sunday athletes. The monitoring of many physical activities is missing, the GPS is missing and even though the step calculation algorithm is improved by recognizing moments of travel compared to a simple walk, the same is still to be considered inaccurate, also because it is not possible to adjust the stride of your step and above all it forces you to always carry your smartphone with you for better data collection. But on the other hand for extra features, Xiaomi offers devices like theAmazFit Bip, the Stratos and why not also theAmazFit Health which even integrates an ECG sensor. Excuse me if fly over the contents of the Mi Fit application, but there is nothing new to report, remaining in fact very simple to use and clear in the use of content, offering the opportunity to start sports sessions related to walking, running, cycling and treadmill. 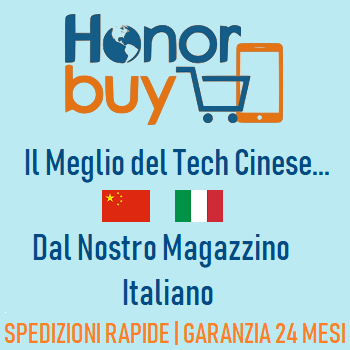 Xiaomi Mi Band 3 is confirmed as one true best buy category, especially considering the price that ranges from 25 to 33 euro based on current offers. In September also the NFC chip version will arrive, which should unlock features related to payments although personally consider this feature completely useless. To date thanks to the firmware translation you will not even have to wait for the international version to arrive. 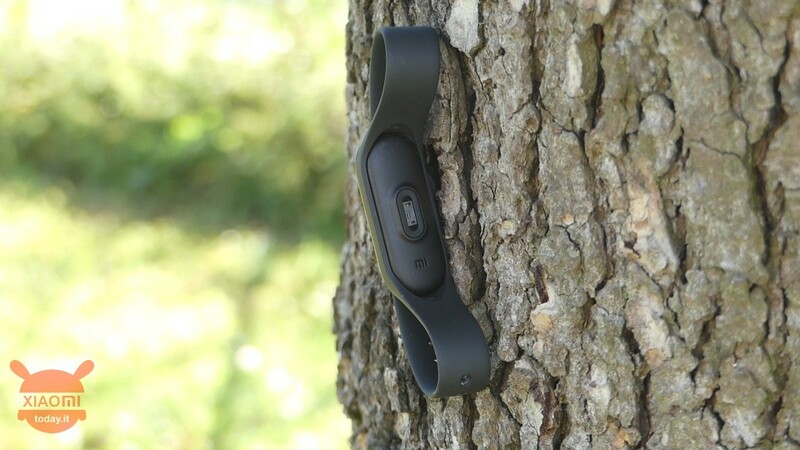 In short, the Mi Band 3 confirms all the strengths of the previous generation, improving them and adding some functions that expand their potential. 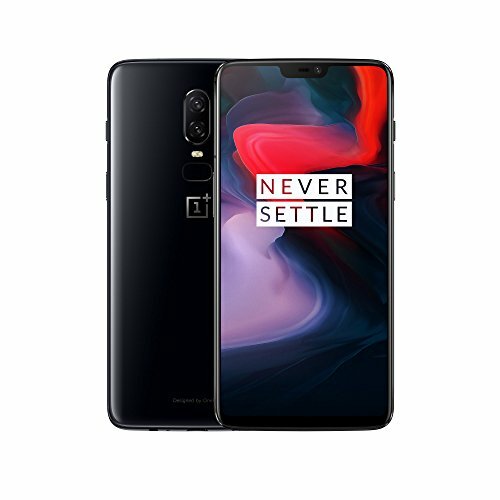 A product suitable for everyone, even for real sportsmen (maybe as emergency monitoring) and I strongly recommend the purchase that you can make through the store Gearbest.com, synonymous with quality and savings. 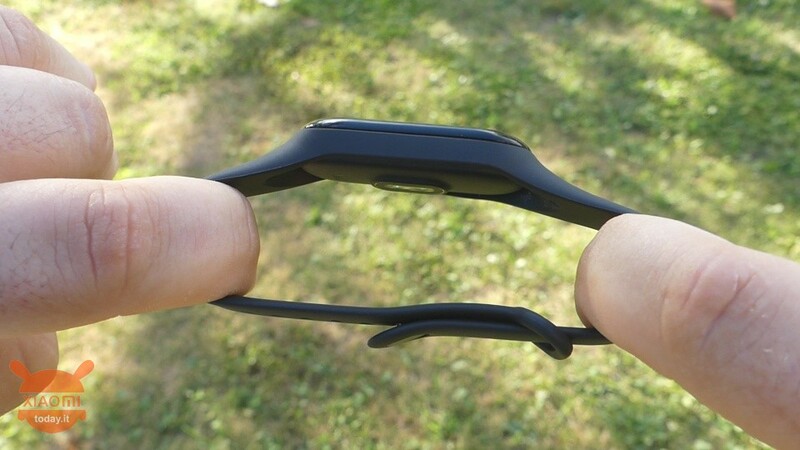 Mi Band 3 costs little, has no construction defects and in its small performs its task in an excellent way. 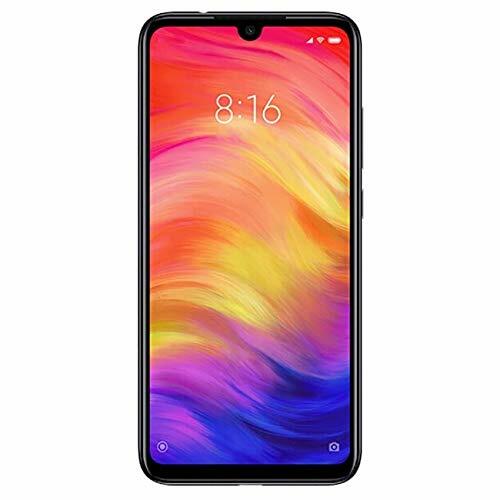 The improvements made by Xiaomi are really appreciated making it even more interesting this product that thanks to the development of dommunicty could soon give us not indifferent goodies, such as for example the monitoring of swimming activities. Of course you need to make compromises but in any case she is the new queen of fitness trackr low cost. On gearbest if I choose the priority line (it costs a little more than 3 euro) can I feel comfortable with the customs? 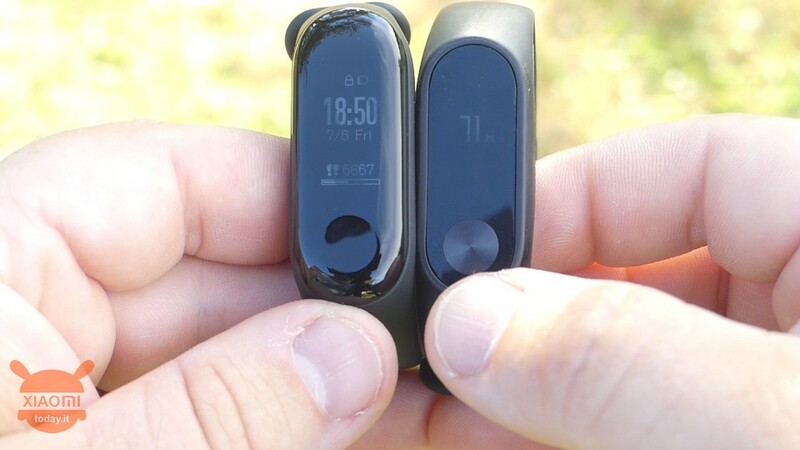 Given that compared to the band 2 seems in fact a step forward ... as we are compared to the honor band 3 and especially compared to the huawei band 2 pro? I have a huawei p8 lite and I can not associate my new band 3, do you have any advice? 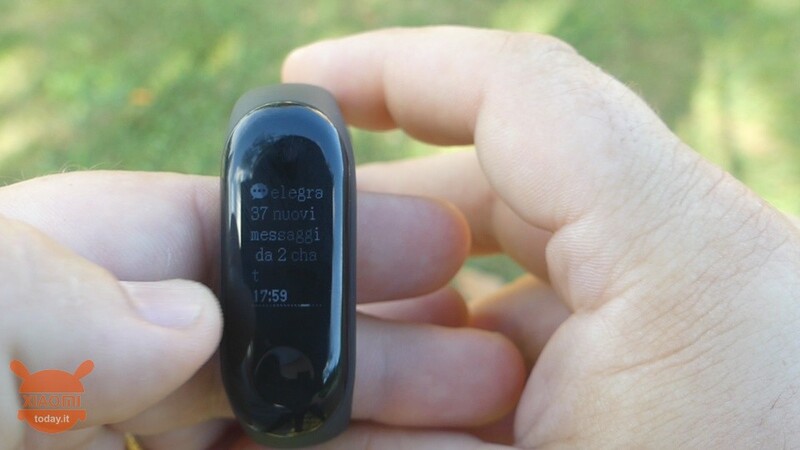 The phone calls and text messages arrive on the bracelet but despite having selected wa and telegram as the notification app when I receive the messages there is no reaction on the bracelet. The app is running in the background and the display is off. I will have omitted some passage? I ask you for advice.